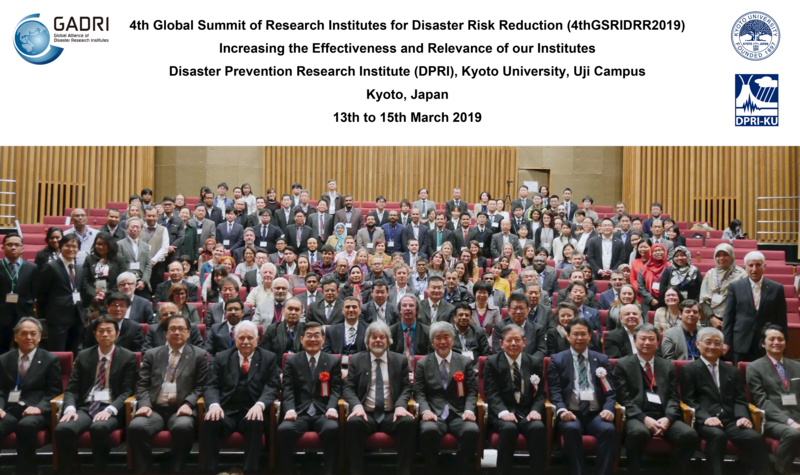 The fourth Global Summit of Research Institutes for Disaster Risk Reduction (4thGSRIDRR2019) took place at the Disaster Prevention Research Institutes (DPRI), Kyoto University, Uji Campus, Kyoto, Japan from 13th to 15th March 2019. It was sponsored by the Global Alliance of Disaster Research Institutes (GADRI) and Kyoto University and is the fourth session of the Global Summit Series which was initiated by DPRI in November 2011. 4thGSRIDRR2019 provided a platform for researchers, practitioners, policy makers, and other stakeholders in both government and non-governmental institutes involved in disaster risk reduction and resilience to come together to discuss, share and exchange ideas to contribute to the priority areas of the Sendai Framework for Disaster Risk Reduction. The conference program included 16 keynote speeches by prominent speakers from various fields and areas of specializations among which were the Government of Japan, The World Bank, UNISDR, Public Health England, Northumbria University Newcastle and others. In addition, the conferences included two group discussion sessions, panel sessions and attracted 52 poster presenters. Among the final outcomes of the conference were the contributions to the contextualization of the global science and technology roadmap. The 4th Global Summit was attended by over 200 participants from 25 states.